The Union of Comoros consists of three Indian Ocean islands, namely Anjouan (Nzwani), Moheli (Mwali) and Grand Comore (Njazidja), of which the latter is the largest. The island group is located at the northern end of the Mozambique Channel, between the east coast of the African mainland and the island of Madagascar. 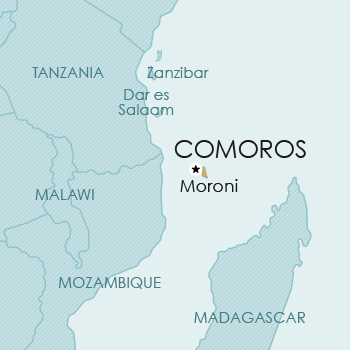 Countries nearest to the Comoros are Mozambique on the mainland to the west, and Madagascar to the southeast. Comoros is a member of the Paris Convention. In 2013, the Union of Comoros deposited its instrument of accession to the Bangui Agreement and became the 17th Member Country of OAPI with effect from 25 May 2013. The Comoros agreed to renounce any of its enacted intellectual property legislation in place before accession to the Agreement. Essentially trade mark, patent and copyright protection in the Comoros is now governed by the Agreement. Any trade mark registration falling due for renewal after this date will automatically be extended to the Comoros with effect from the date of renewal. Proprietors who do not wish to wait until their registrations fall due for renewal but wish to apply for the extension of existing OAPI rights to the Comoros have to make a formal application to OAPI. The exception to this arrangement being the Island of Mayotte which is an overseas territory of France and a French registration automatically extends to it. Comoros is a member of the Paris Convention and PCT. Even though Comoros is a member of the PCT, having deposited its instrument of accession in 2005, the filing of a patent application is not possible at this time as Comoros has no patent legislation. Accordingly, in the absence of any legislation, no patent protection is currently available in this country. Comoros is a member of the Paris Convention. No design protection is currently available in Comoros. Comoros is a member of the Berne Convention. Although the copyright law was apparently put into effect by a government order, as indicated above, it is unclear whether the law is in fact being applied.